Is it possible to live completely waste free? In this multi-award winning, festival favourite, partners Jen and Grant go head to head in a competition to see who can swear off consumerism and produce the least garbage. Their light-hearted competition is set against a darker examination of the problem waste. Even as Grant and Jen start to garner interest in their project, they struggle to find meaning in their minuscule influence on the large-scale environmental impacts of our “throw-away society”. Special Guest Speaker: Chef, writer, and media host extraordinaire, Erica Wides. Erica is the creator and host of Let’s Get Real; the cooking show about finding, preparing and eating FOOD. She's also a columnist for the Huffington Post and NuMi, and has appeared on The Dr. Oz Show, the Food Network’s Top 5 and Chopped, Home Shopping Network, PBS, Sirius Radio, NPR, and in 2013 was invited to speak at TedX Berkeley. Wondering how to transform your very own garden into a pollinator paradise? Join us for an educational presentation about the threats to our local pollinators and the specific plants to grow here in Rye to attract native birds, bees and butterflies. AJ Johnson, Director of Strategic Initiatives, Rye Nature Center, will discuss landscaping techniques that protect and sustain pollinator health, ways to safely manage ticks and mosquitoes, and how to make your outdoor space an oasis for a diversity of beneficial pollinator species. Sample native plants from the Rye Nature Center Greenhouse will be displayed, coffee and light refreshments will be served (bring your reusable mug please! ), and attendees will each receive a packet of native wildflower seeds for planting. Learn more about pollinators here and here. 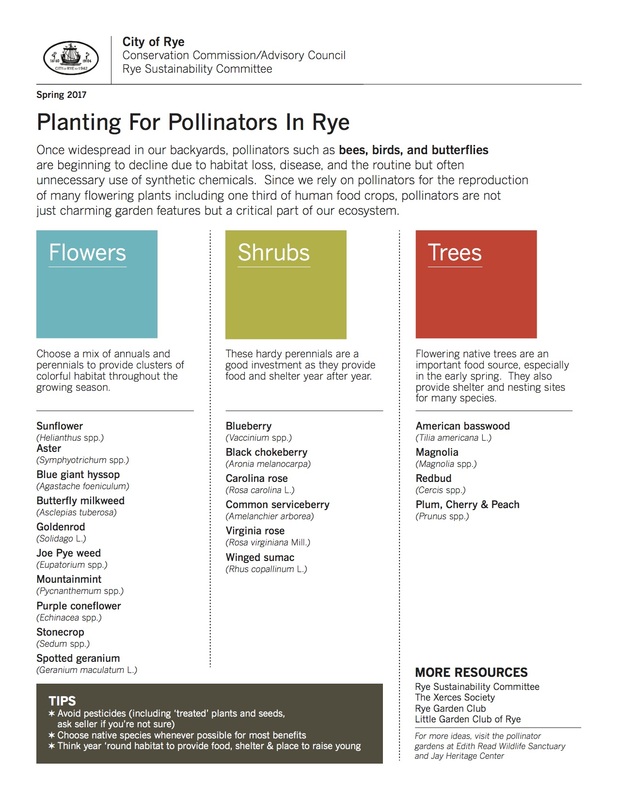 And for more information about how to maintain a pollinator-friendly yard, visit the Rye Healthy Yard Page. 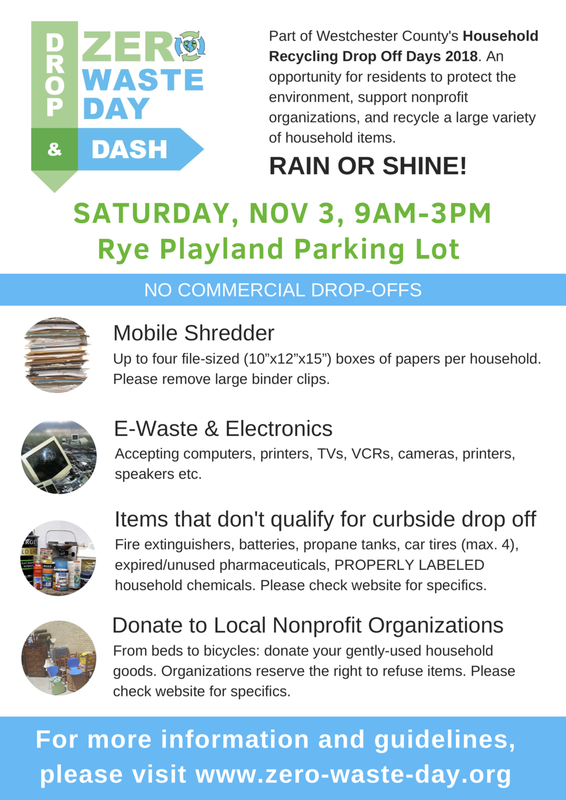 Part of Westchester County’s Household Recycling Drop Off Days (2018), Drop and Dash Zero Waste Day is coming to Rye! Shed your unwanted household items in one convenient location. The day provides the perfect opportunity to do your fall cleaning while allowing others to reuse your items. Rye Sustainability is a proud participant! For more information and a detailed list of the participating organizations, visit the Drop and Dash website. REGISTER FOR THIS FREE EVENT AT EVENTBRITE. As part of its ongoing Rye Healthy Yard Program, Rye Sustainability Committee and Rye Nature Center invite you to join fellow pet lovers to hear about the health effects of lawn chemicals on pets and family. Learn what you can do to keep them safe. Well behaved, on-leash four-legged family members are welcome! Social Media Hashtag: #healthyyardshealthypets. Instagram a photo of your pet next to a Rye Healthy Yard sign with this hashtag before 10/16/18 to be entered to win a free dog toy. Committee (in formation): Patti Capparelli, Suzanne Clary, Ellen Deixler, Linda Mackay, Colleen Margiloff, Christine Siller, Kelly Smith-Powers, Annalise Stack, Suki Van Dijk. Did you use a straw today? It's estimated that each day in the U.S. over 500 million straws are used once and tossed -- enough to fill over 127 school buses daily. Plastic straws make the top 10 list of items found on beaches and the vast majority aren't recycled. Instead they end up in landfills, as litter, or in the ocean. This award winning documentary illuminates the negative impact of straws and other single-use plastics that inundate our waterways. Watch STRAWS to learn how it's in your hands to make that straw your Last Straw! Learn how to turn your leaves into free fertilizer for your lawn with a free talk and demonstration at Rye Nature Center. Watch a video of a leaf mulching demo here. 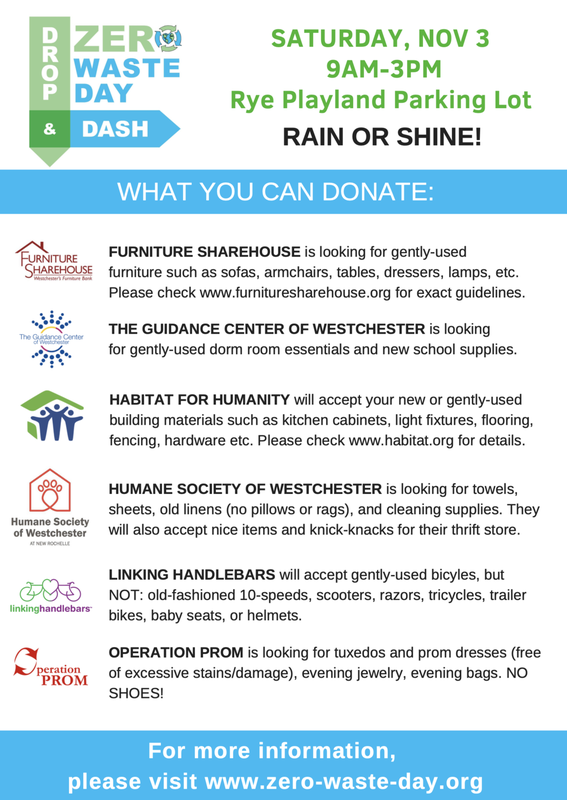 Thank you to sponsors Sustainable Westchester and Rye Nature Center. 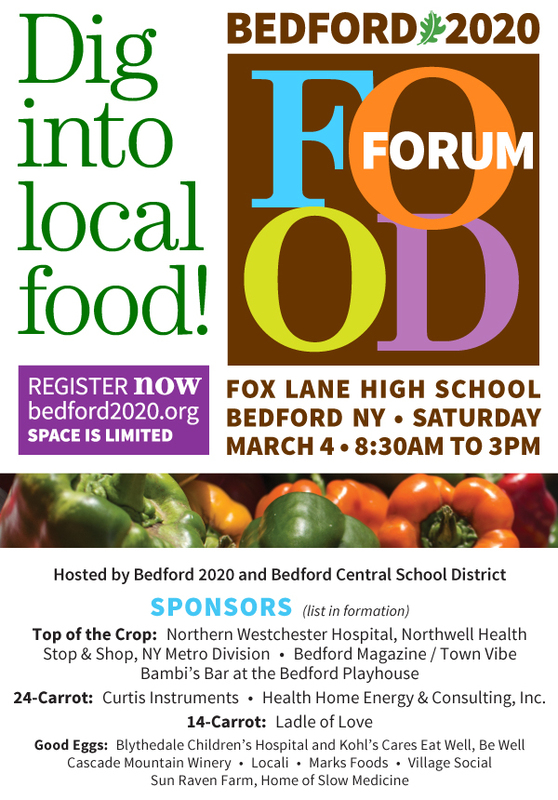 Come celebrate local Hudson Valley food, farming, cooking and more at the Bedford 2020 Food Forum on Saturday March 4th at Fox Lane High School in Bedford, NY! The event is free and open to the public. Please register through eventbrite here. Please join the Rye Sustainability Committee, Rye Garden Club and experts from Bartlett Tree for an informative program about the threats to trees of our area and what we can do to protect them. The 30-minute documentary film, Trees in Trouble will be shown followed by a discussion with certified arborist Frazer Pehmoeller. Frazer has been caring for Westchester’s trees for the past 24 years and specializes in organic care. He will discuss the specific threats he sees in our area and will speak further on the actions suggested in the film which we as a community can take. As part of its on-going healthy yard program, the Rye Sustainability Committee, in partnership with Rye Nature Center, will take an in-depth look at how one Rye resident went from conventional to organic yard care. Program chair Elizabeth Garrett will moderate the conversation between homeowner Stephanie Spierings and her landscaper, Ricardo Acevedo of Greenfield Landscapes, as they walk us through the ins and outs of the process. Audience participation is welcome. Handouts with tips will be provided. Join us as we announce and celebrate the winning designs of the Rye Sustainability Committee's healthy yard design contest, in partnership with The Rye Arts Center. All entrants’ designs will be displayed and prizes will be awarded to overall and age category winners. We look forward to an evening of art and celebration and hope you can attend. The awards ceremony is free and open to the public, but please register here. Learn how to identify and manage non-native plants without the use of pesticides. Help protect the rich biodiversity of wildlife that rely on native species through education and early detection. Invasive terrestrial plants often spread rapidly, outcompeting native flora and creating hard to remove monocultures. Invasives come from all around the world. As international trade increases, so does the rate of invasive species introductions. They can be responsible for habitat degradation and loss, loss of native fish, wildlife and tree species,loss of recreational opportunities and diseases in humans. Master Gardener Ann Barry will show private landowners how to identify and control the most frequently encountered invasive species including Japanese barberry, Norway maple, Oriental bittersweet, mile-a-minute, multiflora rose, garlic mustard, burning bush, black swallowwort, Japanese stiltgrass, wineberry, purple loosestrife and Japanese angelica tree. This program is the result of a Best Management Practices (BMP) collaboration between the Cornell Cooperative Extension (CCE) of Rockland County and Hudsonia together with the Lower Hudson Partnership for Regional Invasive Species Management (LHPRISM). Co-Sponsors of the event include the Jay Heritage Center, Rye Sustainability Committee, Rye Garden Club and Little Garden Club of Rye. The program is FREE and open to the public. The talk will be followed by a walk and viewing of live specimens. Learn how to grow a beautiful garden with natural strategies that can protect wildlife and reduce your family's exposure to synthetic chemicals. Presented by Taro Ietaka, Director of Conservation & Land Stewardship of the Rye Nature Center and Lori Fontanes, co-head, Rye Healthy Yard Program of the City of Rye Sustainability Committee.